Taseqite is a rare mineral of the eudialyte group, with formula Na12Sr3Ca6Fe3Zr3NbSiO(Si9 O27)2(Si3O9)2(O, OH, H2O)3Cl2. It occurs in a cavity in a late-stage hydrothermal albitite vein in alkaline igneous complex. 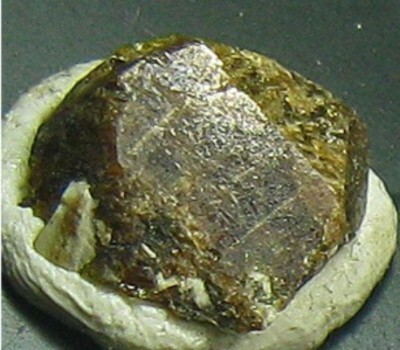 It is a complex yellow-brown mineral found in Greenland. 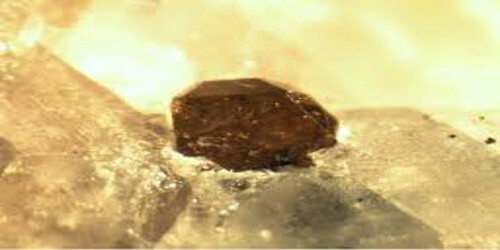 The formula given is derived from the original one and shows a separate silicon at the M4 site, basing on the nomenclature of the eudialyte group. Taseqite, khomyakovite, and manganokhomyakovite are three group representatives with species-defining strontium, although many other members display stronium diadochy. Both strontium (N4Sr) and niobium (M3Nb) are essential in the crystal structure of taseqite. When compared to khomyakovite, taseqite differs in niobium- and chlorine-dominance. Taseqite’s type locality is the Taseq slope located in the Ilimaussaq complex, Greenland – hence its name. At the type locality, taseqite occurs in albitite veins, together with aegirine, analcime, catapleiite, ferrobustamite, hemimorphite, pectolite (silicates); ancylite-(La), calcite, dolomite, strontianite (carbonates); fluorapatite, and sphalerite.